Shall the Town prohibit the operation of Marijuana Retailers, as defined in G.L. c.94G § 1, within the Town of Milford, a summary of which appears below? General Laws Chapter 94G, Section 3, allows cities and towns in the Commonwealth to approve By-Laws or Ordinances prohibiting certain Marijuana establishments to operate. 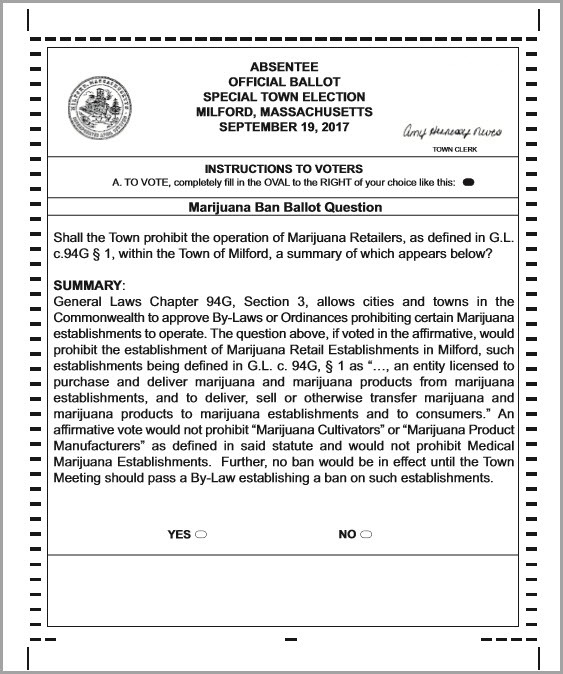 The question above, if voted in the affirmative, would prohibit the establishment of Marijuana Retail Establishments in Milford, such establishments being defined in G.L. c. 94G, § 1 as “…, an entity licensed to purchase and deliver marijuana and marijuana products from marijuana establishments, and to deliver, sell or otherwise transfer marijuana and marijuana products to marijuana establishments and to consumers.” An affirmative vote would not prohibit “Marijuana Cultivators” or “Marijuana Product Manufacturers” as defined in said statute and would not prohibit Medical Marijuana Establishments. Further, no ban would be in effect until the Town Meeting should pass a By-Law establishing a ban on such establishments. To view and download a copy of the sample ballot, click here.